Plants are amazing life forms. They create energy from sunlight, feed countless animals, and can grow and thrive under almost any conditions on earth. 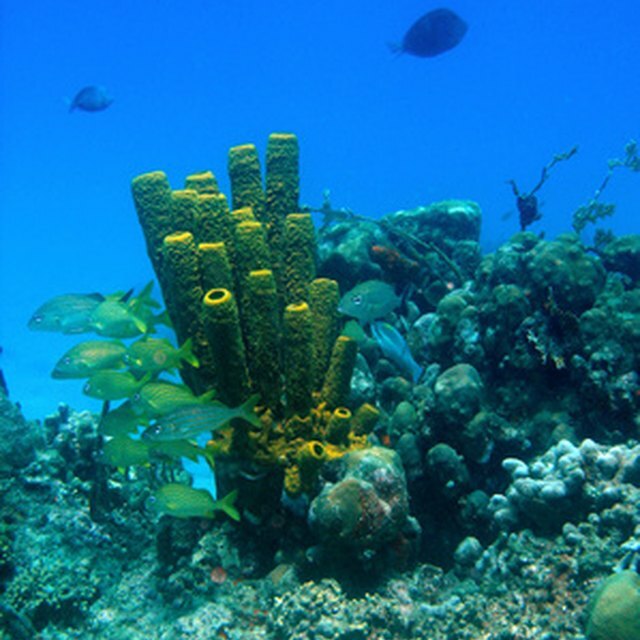 Certain plants have even evolved to live underwater, in the world's oceans. Over millions of years, these plants have developed adaptations that make them quite different from plants that live on land, and that help them face all sorts of challenges in their watery environment. TL;DR: Ocean plants have developed adaptations such as the ability to absorb nutrients from water, the ability to float and the ability to anchor themselves to rocks on the ocean floor in order to thrive in their challenging environment. Where Do Ocean Plants Get Their Energy? Like land plants, ocean plants derive energy from sunlight. However, land plants also have extensive root systems, which allow them to absorb water and nutrients from soil. Land plants also absorb carbon dioxide from the surrounding air. Sunlight, water and carbon dioxide are necessary for plants to live. But ocean plants do not have extensive root systems, nor are they exposed to air. Instead, they have adapted to absorb all the water and carbon dioxide they need from the water they live in. Of all ocean plant adaptations, this is the most basic. Plant structures vary greatly based on environment. This is especially true for plants living in water versus plants living on land. Consider the differences in structure between tall blades of grass and long strands of ocean kelp. At first glance, they might not seem so different. Both grass and kelp grow in clusters, and they're both long, tall and green. But grass has adapted to be rigid in order to stand upright. Kelp, although it appears to grow upright, actually uses gas-filled bladders on its leaves to float. In other words, the water around it holds up its structure. If a long piece of kelp were removed from the water, it would no longer stand upright. Over time, living things evolve to deal with the specific challenges presented by their environments. Just as cacti have adapted to live in brutally hot deserts, ocean plants have adapted to deal with things like ocean tides and the salinity, or salt levels), of the water around them. Many ocean plants, such as different species of algae, cling tightly to rocks in order to avoid being swept away by ocean tides. Unlike land plants, whose roots can extend deep underground, ocean plants tend to have roots that wrap around rocks or other solid structures on the ocean floor. This effectively anchors them against the tide. Ocean plants have different ways of dealing with the salinity of sea water. Some plants store salt from the water and eventually dispel it. Others break the salt down into its most basic elemental parts, namely sodium and chlorine. Many ocean plants have also developed membrane barriers around their roots, which protect them from salt. From using water to help keep themselves afloat to rooting themselves to rocks on the ocean floor, ocean plants have developed many unique adaptations that help them thrive. Cook, Maria. "Adaptations of Ocean Plants." Sciencing, https://sciencing.com/adaptations-ocean-plants-6560351.html. 19 April 2018. What Is the Function of Air Bladders in Seaweed?